Discussion in 'Cars in General' started by GTPNewsWire, Oct 1, 2018. This article was published by Andrew Evans (@Famine) on October 3rd, 2018 in the Car Culture category. One black car, one gold eagle and a most impressive mustache. Smokey and the Bandit was not only a classic renegade smuggler story, but also kick-started a very short-lived trend for CB radio - Smokey being CB slang for the police. Bandit's Trans Am, intended to attract the cops and distract them from the big rig smuggling... Coors (really), certainly had the desired effect, and it became one of Burt Reynolds' most famous movie roles. Think Mini, think The Italian Job. This classic 60s heist caper featured the famous city car as getaway vehicles. Charlie Croker's crew packed their stolen gold into the trunk of three Minis and escaped down the lesser traveled roads of Turin - including a shopping mall, the sewers and the famous Lingotto test track. Sadly, all three met with a grisly end, disposed of once their job was done. Spaceballs - Winnebago Chieftain "Eagle 5"
An undisguised parody of Star Wars (Lucas's Industrial Light & Magic worked on both), Spaceballs has achieved a cult classic status along with other Mel Brooks films like Men in Tights and Blazing Saddles. Part motorhome, part spaceship, the Eagle 5 takes the place of the Millennium Falcon and is home to Bill Pullman's Lone Starr and John Candy's Barf, as they try to stop planet Spaceball and Dark Helmet stealing air from other planets - at Ludicrous Speed. Altogether now: "May the Schwartz be with you." AgentBlackDog, silverman_GT and PocketZeven like this. Herbie's fame is almost total. Few people will hear the name Herbie and not instantly think of the tiny, mischievous, off-white #53 Volkswagen. The star of a bunch of innocent comedies of the 1960s, 1970s and 1980s (and one utter pup of a film with Lindsay Lohan), Herbie - along with Chitty Chitty Bang Bang to an extent - was one of the first car personalities. Herbie himself was the lead character, and the humans he encountered mere bit-part players. And an early warning for what autonomous cars could become. Confusing audiences since 1971, Vanishing Point is the story of a car courier who decides to drive his latest delivery - a 1970 Dodge Challenger 440 - from Denver to San Francisco. The car itself isn't so much a star as a stage; Kowalski's scenes are mostly in the driver's seat as he tries to make it to Frisco at an average of 100mph to hit his self-imposed deadline. Instead he hits two bulldozers... or does he? If you've not seen American Graffiti, think Grease but with more actual grease and far less saccharine. It's a classic American coming-of-age film, as the teen stars move on from their home towns to go away to college (or Vietnam). Any number of the cars in the film could make this list, but only the Ford V8 Deuce Coupe - the car driven by Modesto's "drag-racing king" - made it through the voting. Imagine the Transporter, but instead of an underworld courier you have a speed-fiend pizza delivery driver who's found a new career as a taxi driver. That's Taxi, right down to the location and production team - Taxi is the brainchild of the lightly crazy Luc Besson. Daniel Morales' Peugeot 406 is one of a kind - the crew reportedly used a modified 406 BTCC car for some driving sequences - and the film was successful enough to spawn FOUR sequels and a dreadful US remake with Queen Latifah. AgentBlackDog, girabyt3, silverman_GT and 2 others like this. The Dukes of Hazzard - Dodge Charger "General Lee"
Better known on the small screen, the General Lee made its way to film - and eligibility - with a 2005 movie for Johnny Knoxville and Seann William Scott. It's a pretty faithful update (certainly compared with Knight Rider's attempts at films) even though it got seven Razzie nominations. One of the things that carries through untouched is that giant, orange Dodge Charger with what's now a slightly inappropriate roof design. You're singing the horn noise in your head right now. It's probably the world's most famous ambulance (although the competition is this and Captain Chaos's Dodge from Cannonball), despite the litany of problems Ray comes up with. For that matter, it's likely the fourth best-known member of the Ghostbusters team - it gets more screen time than Winston Zeddemore... One round of that siren and you'll immediately know that some guys who aren't afraid of no ghosts (except Slimer, Gozer, Vigo the Carpathian, etc.) are on the way. For kids growing up in the 1980s, Batman was kitsch, campy and cartoonish. Then along came Tim Burton and Michael Keaton. Batman and Batman Returns still had that comic aspect - observe the Joker's henchmen - but brought a dark heart to Gotham that we've come to know and love. This Batmobile is a symbol of that. The absurd jet engine, the cornering grappling hook (for 90 degree left turns at walking pace; the actual driving sequences were pretty poor), the fighter canopy... Burton's Batmobile is arguably the best, but only one of three in the final 32. Speed. I am speed. As if he needs an introduction, McQueen is the arrogant and slightly dim hero of Pixar's Cars series of films. He's a generic NASCAR stock car - no make or model ever attributed to him, perhaps in a sly dig at the one-body, many-faces nature of the series - who comes a cropper on his way to a championship decider. Along the way back he makes friends with a number of cars he wouldn't normally mix with, learns lessons and finds a new humility. And two weak sequels. Gone in Sixty Seconds (2000) - Shelby Mustang GT500 "Eleanor"
Although the original Eleanor makes it into our final 32, the remake does too. The Nic Cage heist caper sees Memphis Raines and his crew trying to steal 50 cars in one night for an export order. To fool the cops, the gang uses codenames for each of the 50 cars and the Shelby Mustang - Raines' unicorn car, as he's never been able to get away with stealing one - is Eleanor. We wouldn't say he's exactly successful this time either. A battered cop car - with a 440 engine, cop tires, cop suspension, cop shocks - and the most ludicrous speaker ever created (actually an air raid siren), the Bluesmobile helps Jake and Elwood escape the law in their mission from God to raise $5,000 for the orphanage they grew up in. It's 106 miles to Chicago, we got a full tank of gas, half a pack of cigarettes, it's dark... and we're wearing sunglasses. Hit it. For many this is the definitive Batmobile. It wasn't the first, but it may be among the most memorable (and it's one of three here), as it carried Adam West's campy TV Batman and Burt Ward as his... ward Robin to many capers, from Thwock to Kerpow. With the feature length movie in 1966, the Batmobile became a silver screen star too, as Batman fought to foil the plotting of Joker, Penguin, Riddler, and Catwoman combined. AgentBlackDog, girabyt3, silverman_GT and 1 other person like this. When this baby hits 88mph, you're going to see some serious ****. This car was by far the most popular in our initial shortlisting and it's not hard to see why. The DeLorean itself has a ridiculous back story and the stainless steel body is iconic, and then Doc. Emmett Brown made it into a time machine. Easily the third star of the three films, behind the wacky Chris Lloyd and cool teen Michael J. Fox, this DeLorean has a nuclear heart, manages to be in three places at once and can eventually fly. Although, like so many others on this list, it gets absolutely obliterated at the end of the story... unless you think fourth-dimensionally. If this film had been the one and only, the Supra might be the most memorable of the very many cars in it. Introduced as a burned-out wreck, this is the "ten second car" Brian owes Dom, and uses to get inside the Toretto family circle while investigating heists of 14-inch CRT/VCR shipments. It was 2001. After whipping a "more than you can afford" Ferrari and chasing down the real bad guy, Brian lets Dom escape in the Supra after the climactic drag race. Sadly Dom came back, but the Supra didn't. When it comes to bodycount, Christine wins. By the time the movie's main human player appears on the scene, Christine - identified as a Plymouth Fury, but actually a Belvedere made to look like Fury - has already killed at least four, not to mention eating a man's hand. The possessed, self-healing auto then crushes, explodes, burns and smothers its way through the movie until finally ending up as a cube... or does it? Bond and cars. This list could almost be exclusively Bond cars, and as it is there's three. There's certainly an argument for this to be the coolest, and not least because it's involved in a chase over an ice shelf and through an ice hotel. One of Q's creations in his John Cleese era, the Aston has adaptive camouflage which means that the Vanquish can... Vanish. Sounds ridiculous, but this was peak Bond gadget. Other Bond cars come and go, but the DB5 is eternal. In the film series, the Aston is the first official company car the secret agent drives. Equipped with an ejector seat, primitive satellite tracking system, wheel scythes, bullet shield and machine guns, it was the first glance at the bloated budget of the Secret Service and the gadgetry on offer. In its first appearance, Bond crashes it into a wall after getting confused by a mirror, but it's made it to six more Bond films since. Gone in 60 Seconds (1974) - Ford Mustang Mach 1 "Eleanor"
GTPlanet's members voted for both Eleanors to appear on this list - despite some arguing over which was the "right" one. The plot is broadly similar, with Maindrian Pace running a professional car theft gang, but his plan to steal 48 cars is voluntary and has a slightly longer deadline. The crew gives all the cars female codenames, and the original Eleanor is a 1973 Ford Mustang fastback. It's no less cursed than in the remake, with Pace stealing four different cars before meeting success. 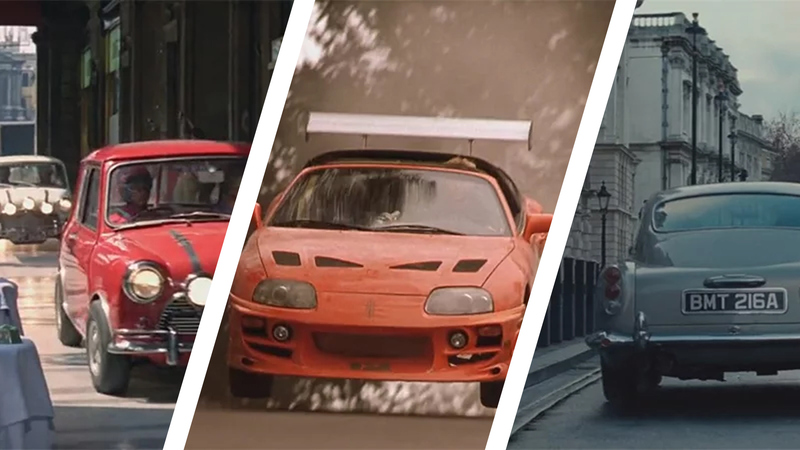 Few cars survive a Fast and Furious film. The Charger isn't one of them, but the gang keep on rebuilding it. Toretto's father's car, the Charger appears in the first film and somehow gets through a rollover crash to come back in the fourth film. There it's rammed head on into a tunnel wall at high speed and explodes, but is still there at the end to spring Dom from the prison bus. We're not sure how it'll make it back from being jumped into a helicopter from a collapsing parking structure in film seven, but odds are good it'll be in mint condition again in the next installment. Chris Nolan's gritty Batman trilogy required a slightly more military approach, and the Tumbler was it. Constructed for the first film, Batman Begins, the Tumbler started it fictional life as a vehicle for creating temporary bridges - jumping across gaps - as a military research project by Wayne Enterprises, before the returning, vengeful Bruce gets his hands on it. From there it becomes the Batmobile (although never named as such) and although destroyed in the second film, reappears in Bane's arsenal in the third. It scores good points for the fact they actually built it - or rather them. There's four in existence and all are the real deal. Mad Max (series) - Ford Falcon XB GT "Pursuit Special"
Before there was Tom Hardy, there was Mel Gibson as the Road Warrior Max Rockatansky. Gibson's films, set in a world teetering on - and then plunging into - apocalypse sees Max go from cop to vigilante after a gang murders his wife. The black Pursuit Special and its giant, supercharged V8 is as much of a star as Gibson himself, even though the car is destroyed halfway through the second film - hence its appearance at the very start of 2015's Fury Road. We think this is the only Anime-derived car on our list. The Mach 5 is, in the original Japanese, one of the eponymous stars of the comic. Originally called "MachGoGoGo" ("go" is both Japanese for "5" and the name of the car's driver, Go Mifune), Speed Racer sees the title character embark on a racing career with the Bond-inspired, gadget-laden Mach 5 race car. Appropriately for a Lampoon film, the Wagon Queen Family Truckster station wagon - a modified 1979 Ford LTD Country Squire - was itself a mocking jab, at American family cars. The woody-style, dreadful paint color and excess of headlights was a caricature of the type of banal car on offer at the time. Nonetheless, the car - and the film - have become something of a cult classic. When conversation turn towards the greatest car chases in film, this one's right up there. Yes, the Charger misses the gas station completely, and yes, they pass the same green Beetle about a billion times, but the soundtrack and wheelcraft is wondrous. The fact that it's two amazing pony cars head-to-head through city streets helps, and though the Charger plays its part, it's Frank Bullitt's Mustang that steals the show - and the DVD cover. It's an icon Ford itself has used, creating Bullitt special edition versions of the Mustang, and if that's not a strong enough argument for the car's place in this final 32, nothing will be. While certainly memorable, the Skyline's screen time in its film is among the shortest of anything else here. It only appears in the first part of the film, and doesn't even live through that. After winning its opening street race, complete with implausible bridge jump and dreadful CGI, the feds use an electronic stinger to scramble the car's systems and Brian promptly crashes it. Yet among the hundreds of modified cars in the film, the silver Skyline with the blue graphics and blue underbody lights remains the one most remember. James Bond (The Spy Who Loved Me) - Lotus Esprit S1 "Wet Nellie"
Roger Moore never drove Bond's DB5 in his films (although he did in the Cannonball Run; see Group A). Instead he was more linked, thanks to a marketing coup, with the Lotus Esprit. He got through three in total, and the first was by some margin the best. The ultra-cool white S1 was stunning in its own right, but when Bond launches it off a pier into the sea it became even better. The car was Q Branch's "Wet Nellie", a submersible. Along with being able to amble along the sea bed, this Esprit had depth charges and surface to air missiles (hiding in the engine bay, somehow), and could drive right up a beach when Bond was bored of the water. Probably the worst movie on the list - or at least the most B-movie movie on the list - is The Wraith. A fundamentally inexplicable plot sees Charlie Sheen as an avenging angel who uses a supernatural performance car to kill off the members of a street-racing gang who murdered him (but not him; don't ask). Still, the racing scenes are pretty neat and the Wraith's car is still one of the coolest vehicles to make it to film. Officially known as the M4S, it was built to be an IndyCar Pace Vehicle and could crack 195mph. Although most scenes in the film with the car actually used mocked-up dune buggies, the real thing does appear in some static shots. We're using a well-known Twitter polling format called "World Cup of" (as seen in the World Cup of Biscuits). Some of you don't have Twitter accounts, so you won't be able to vote in this - which is a bit of a shame as your nominations created the original 70+ car list and your votes created this final 32-car shortlist. I seeded the cars according to how many votes they got and used a random number generator to allocate them into groups - the top eight cars polled are all in different groups, as are the next eight and so on, in a completely random draw. And then the final itself. Then we'll crown the winner as the greatest movie car of all time. Jordan, TexRex and PocketZeven like this. I dont see how the DMC-12 can lose! I don't see how the XB and Bullitt Mustang lost. Hate Fords much? Or just youth don't know those movies? Both are there. How do you figure they lost? I don't see how the XB and Bullitt Mustang lost. Voting is still open. They haven't lost yet. For the moment, it doesn't look good. Oh, and good work with the write ups. Cool stuff. silverman_GT and PocketZeven like this. I am not american and agree with you that the bullit Mustang is more Iconic in cinema then the Skyline. But I disagree with the XB vs the Ferrari 250. The Ferrari had a more significant role in Ferris Beuller then the XB in Mad Max. It could indeed, but the Chevrolet One Fifty from Two-Lane Blacktop tied 39th in the GTPlanet poll with two votes, and didn't make it through. The list really is GTPlanet members' choices. We used the original 40 cars from the original survey, added a bunch of cars from the editorial team and anything suggested in the thread for the original survey. We pretty much discarded anything with two stars or fewer on IMCDB and kept anything with four stars or higher, and then went through the three star cars on a case-by-case basis; the 2F2F R34 is a three star car that made it through - it's not in the film for long, but it's the car most associate with the film, even if Brian drives the green Lancer for more time, and it stars in the hero stunt at the beginning. I think we ended up with 69 cars, and GTPlanet members voted for their favourites over a couple of weeks (I gave them ten choices in the poll ) to finish up with the final 32 (actually 31 - I ran another poll in the editorial forum to pick the 32nd car from the six cars tied for 32nd). I used the vote counts to seed the cars. That put the top eight - DeLorean, Bullitt Mustang, Trans Am, DB5, General Lee, Falcon Pursuit Special, Eleanor GT500 and Herbie - all in different groups so they wouldn't face each other. The same with the second eight, third eight and fourth eight. All eight groups have a car from the top seed pot, second seed pot, third seed pot and last seed pot. I used a random number generator to pick a car from each pot to go into each group. That's thrown up some interesting combinations. Group E is a horror show, while Group D is quite weak. But it was all random. I think everything here is because GTP members voted for it. Some of them are from the original poll or from editorial team suggestions, but it didn't get through to the final 32 unless it got enough votes from the GTP members. coryclifford and ProjectF like this. Ameer67, PocketZeven, silverman_GT and 3 others like this. mustafur, Mad Matt, TheCracker and 2 others like this. Definitely. I love the great community here at GTPlanet and taking it out to the often frankly toxic Twitter, is as you say a shame. I know the other thread didn't get a great response but with a news article I'm sure it would've done. Yeah, I didn't even see the other thread. Where is it? @Famine mentioned doing something cool with the results of the polling there, but I wasn't expecting this degree of follow-through. I'm very impressed. I'm afraid you've catastrophically misunderstood, even though I laid it out in post #10. We should do our own survey. With Blackjack. And hookers. We pretty much discarded anything with two stars or fewer on IMCDB and kept anything with four stars or higher, and then went through the three star cars on a case-by-case basis; the 2F2F R34 is a three star car that made it through - it's not in the film for long, but it's the car most associate with the film, even if Brian drives the green Lancer for more time, and it stars in the hero stunt at the beginning. When the voting is done, we're going to take the 32 highest scoring cars and we'll do something cool with them. And the response was great (aside from the people complaining a car no-one had suggested in over a month to do so wasn't included). We had over 400 votes cast for the cars. We were able to take the top 31, plus a 32nd car taken from a six-way play-off, and do something cool with them. It's always been the intention to take GTPlanet members' suggestions, voted on by GTPlanet members, to create a shortlist of GTPlanet's greatest ever movie cars and shove it out to a Twitter vote. This was the point - this is outwardly showing what a great and knowledgeable community GTPlanet is: GTPlanet members have had their say at every step of the process, right from giving me the idea to do our own, right to this list of 32. And GTPlanet members with Twitter accounts can still vote, of course. The response on Twitter has been anything but toxic. We've had around 2,300 votes cast already, and most responses have been either positive or wondering where "X" car is (and the answer on all occasions has been "It's in Group [X]", because we all have picked a pretty handy set of 32 cars). To be honest, I'm pretty pleased so far - and we're still a ways from the final result. The 250 was like the 928 Joel used in Risky Business: "Taking a ride in Daddy's car. ". No doubt about its role. It is arguable about the XB being the last of the V8 interceptors. I can't believe the Peugeot's new owner is a GTPlanet member, that's awesome! Congrats! Your friend Franck has a very interesting company there; I would love to come by for a visit the next time I'm in France. silverman_GT, poumpoum and Famine like this. I'm missing KITT from Night Rider, I know it's a TV series but so was The Dukes of Hazard. Granted the latter has 1 movie spinoff but it that the reason for being on the list or not, ooh well. Nevertheless I'll vote this weekend on Twitter. Actually the dukes of hazzard had 3 movies made. The 1st was a made for tv movie with the original cast in the 90s, the 2nd was the most well known with johnny knoxville and sean williams scott, and the 3rd was a direct to video movie which honestly i feel was the best one of the three. It was rated R and i feel had more of the gritty feel then the tv show. As if it was what the dukes of hazzard was suppose to be...but you know, 1980s network tv. An interesting fact willie nelson played uncle jesse in the last 2 movies. And in the last one yes, he was caught smoking weed.